Chicago Bulls Motor De Arranque Bomber EE.UU. CHAQUETA CHIGAGO BULLS. DE CASA DE NO FUMADORES. COLECTORES DE SABEN SU VERDADERO VALOR. NO TRAGE- Y RASTROS DE USO. Anchura de los hombros: 57,00 cm. De envío gratis. CHAQUETA DEL TOROS DE CHICAGO. DE CASA DE NO FUMADORES. COLECTORES DE SABEN SU VERDADERO VALOR. TRAGE NORMAL- Y RASTROS DE USO. Anchura de los hombros: 54.00 cm. De envío gratis. PRECIOS JUSTOS. Longitud total: 64.00 cm. Premium embroidery and custom detailing inspired by the City Edition kit. Machine wash. A COLLECTIBLE JACKET TO SHOW YOUR PRIDE. Premium embroidery and custom detailing inspired by the City Edition kit. Machine wash. A COLLECTIBLE JACKET TO SHOW YOUR PRIDE. Fabric: Body: 100% nylon; Lining/fill: 100% polyester. Mitchell & Ness Chicago Bulls Jacket. This is a size Mitchell & Ness size XL. I have been lucky enough to have 2 of these. I sold one new for £150. This one is preowned but is in great condition. (See photos). Vintage NBA Chicago Bulls Leather Bomber Jacket- Size Small. Condition is Used. Dispatched with eBay delivery – Shutl 1 day. Parts of the jacket and 2 blue markings by the left hand pocket. I have shown. as pulls and bobbles in a few places. There is also a little yellowing on the white. 860789 010 BLK/RED BNWT. 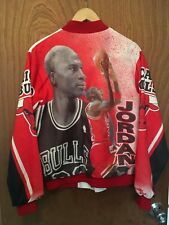 NIKE OFFICIAL NBA CHICAGO BULLS MODERN VARSITY JACKET XL. Nike Chicago Bulls Modern Varsity Jacket. One side entry pocket is mirrored by a single zipper fastening pocket and a double ended zipper fastening sits to the front and centre. Judge condition from pictures or message if you have any further queries. Have a look at my other items as I’m having do a major clear out. Happy bidding! · Machine wash. · Premium stitching and custom embroidery inspired by the City Edition kit. · Body Material: 100% nylon, Lining/fill: 100% polyester.